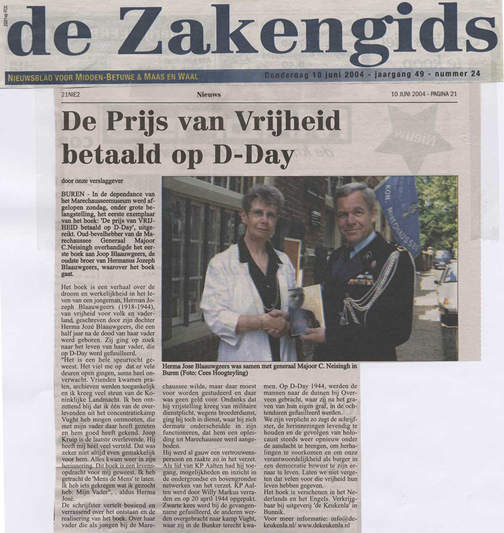 Buren/Netherlands: Last Sunday, the first copy of Freedom isn’t Free, the price was paid on D-Day, was presented to a large audience at the Marechaussee (Military Police) museum in Buren. The previous Chief of Staff of the Marechaussee, Major General C. Neisingh handed the first copy of the book to Joop Blaauwgeers, the oldest still-living brother of Hermanus Jozeph Blaauwgeers, whose life is the subject of the book. The book is a story about the dream and reality of the life of a young man, Hermanus Jozeph Blaauwgeers (1918-1944), about the freedom of citizens and country, written by his daughter Herma-Jozé Blaauwgeers. She was born 6 months after the death of her father. She researched the life of her father, who was executed on D-Day. "It has been quite a journey. I noticed that many doors opened, some of them very unexpectedly. Friends stepped in to talk, archives were made available and I received great support from the Royal Netherlands Army and the Royal Marechaussee. I was delighted to get to meet one of the survivors of the concentration camp Vught, who was there at the same time as my father and who knew him well. Joop Kruip is the last survivor of the camp still alive. He told me quite a bit and gave me great insight into the camp life. It sure must not have been easy for him. He had to recall everything. This book has the purpose of my life. I tried to portray the "human, the person". And I received something I was searching for: "My Father", Herma-Joze says. The author tells an interesting and surprising story about the conception and realization of the book. About her father, who as a young boy had the dream to become a Marechaussee, but for that he had to study for which there was no money. Even though he didn’t have to serve a military term, he did and performed in such a way that his superiors offered him to become a Marechaussee. Pretty soon he became the trustee of many and as a result ended up in the resistance. As a member of resistance group KP Aalten, he got inside knowledge about the underground and known networks of the resistance. KP Aalten was captured on April 20, 1944 through the work of a traitor, Willy Markus. Black Kees (the leader of KP Aalten) was shot at imprisonment, the others were brought to Camp Vught, where they were placed in "The Bunker". On D-Day 1944, the men were transported to the Dunes, near Overveen. There, after having to dig their own graves, they were executed. We have the responsibility, the author says, to keep the memories alive and to bring the results of the Holocaust again in the forefront of people's mind in order to avoid a repeat, to be aware of our responsibility as a citizen and to live our lives that way. Let’s not forget the many that gave their lives for the freedom of others. The publisher published the book in English and Dutch: "De Keukenla" in Bunnik, the Netherlands.